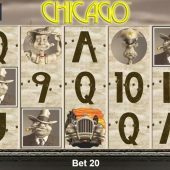 Chicago slot was Novomatic's first game of the genre before they released American Gangster but was preceded by Betsoft's classic Slotfather which proved to be popular with the players, so much so they gave us The Slotfather II more recently. So we have the game set against a cartoon cityscape and the Mob have certainly been busy with the Thompsons as we see the reels are riddled with bullet holes although we keep the usual Novo wheedle-and-trot sounds as we spin. This appears to be a dangerous place to live, so is it wise to walk into town with a bankroll in your pocket? The reels get us in the mood like an old Bogart movie as they are in black-and-white car which is our scatter. There are 20 pay lines over 5 reels of 3 rows each and your icons are single including the Wild which is the game's logo and has a nice animation of driving along the street when it counts in a win, which hopefully would be a 5-of-a-kind as it pays 500x bet! The cartoon characters are our Gangster and Detective paying 100x, the Moll 50x, the Cop and Street Urchin both 25x and finally six card values at either 12.5 or 10 for a full line. To trigger a great bonus round, we need the only splash of colour in the game, the Car against an orange sunset, to appear three or more times anywhere in view. Having seen our 3 scatters we are given 12 free games with an entertaining quirk. Above the reels will appear 5 moonshine bottles with 1x-2x-3x-5x-10x and any win occurring will see bullets aimed at them, smashing them. Your win is multiplied by the last one standing. Retriggers can occur and like many Novomatics scatters tend to appear more frequently in the free games.